The 2012 Notre Dame Shakespeare Festival (NDSF) will run July 14 through Aug. 26, highlighted by the Professional Company’s production of “Hamlet,” directed by David H. Bell. Other performances include “A Midsummer Night’s Dream,” presented by the Young Company at outdoor spaces throughout the Michiana region; Beyond the Stage, a performance-based lecture series, which will be presented at select venues in July and August; and ShakeScenes, which will open the festival with performances at historic Washington Hall on July 14 and 15 (Saturday and Sunday). William Shakespeare’s most famous play, “Hamlet,” will be presented Aug. 14 through 26 at Notre Dame’s DeBartolo Performing Arts Center. The title role will be performed by Andy Truschinski, who returns to NDSF after appearing in “The Merchant of Venice” at last year’s festival. Also appearing will be Lisa Brescia (currently performing on Broadway in “Mamma Mia!”) as Gertrude. NDSF and Chicago Shakespeare Theater veteran Elizabeth Ledo will portray Ophelia, and Stratford Festival veteran Don Carrier will play Polonius. Also joining the cast are Jeff Cummings as Claudius and Daniel Cantor as Hamlet’s father/leading player/gravedigger. Tickets range from $10 to $75 and go on sale through the DeBartolo Performing Arts Center ticket office on July 5 (Thursday). 7 p.m. Aug. 5 (Sunday) — Wellfield Botanic Gardens, Elkhart, Ind. The Beyond the Stage series features a performance-based lecture titled “An Eye for an Eye in Shakespeare’s Time.” Ryan Producing Artistic Director Jay Paul Skelton will explore the implications of vengeance from the tragic viewpoint of Hamlet and the comic stance of “A Midsummer Night’s Dream.” Actors from the Young Company will share a sample of this summer’s productions as well as others from Shakespeare and his contemporaries. Presentations will be at 3 p.m. July 21 at the Acorn Theater in Three Oaks, Mich.; at 7 p.m. July 31 (Tuesday) at New World Arts, Goshen, Ind. ; and at 7 p.m. Aug. 7 (Tuesday) in the Philbin Studio Theatre of the DeBartolo Performing Arts Center. Tickets are $10 and are available at each theater’s box office. Shakespeare at Notre Dame is a pre-eminent center for the study of Shakespeare in performance, educational outreach and academic research. 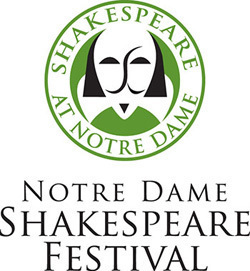 Shakespeare at Notre Dame includes the Notre Dame Shakespeare Festival, Actors From The London Stage, visiting guest artists and lecturers, touring productions and new media library collections. Tickets for “Hamlet” will go on sale at noon July 5 at the DeBartolo Performing Arts Center Ticket office, by phone at 574-631-2800 and on the Web at www.shakespeare.nd.edu. Note: Interviews and photos are available. Please contact Chuck Gessert, cgessert@nd.edu. Originally published by Chuck Gessert at newsinfo.nd.edu on May 22, 2012.